Like most performing artists, Sweet Adelines have a language all their own. What follows is a quick snapshot of terms you may come across on the website. You will almost certainly hear many of these concepts or phrases bounced around during rehearsal. A more in-depth list is available on our members-only website. Become a guest and you will be granted conditional access to the inner sanctum of our music section. In the meantime, consider this a crash course for the casual observer. a cappella: Vocal music performed without instrumental accompaniment. Baritone: The harmony part sung both above and below the lead line but rarely below the bass and never above the tenor, to the relief of many a neighborhood dog. Bari notes are found in the bass clef, above the bass line, sung an octave higher than written. Bass: In terms of range, the lowest singing voice part. Bass notes are written in the bass clef, lower than the baritones, and sung an octave higher than written. Bridge: The main body of a song, after the intro and before the tag. Competition: Competition is not an unfamiliar term, but it helps to know we compete at two levels - both the regional level (once a year, in the spring) and the International level (every other year, in the fall). Cone: Harmonic balance in barbershop is stacked in a cone shape, not a cylindrical shape, as with traditional choral music. Confused? Check out our barbershop page. It will demystify the subject for you. Crescendo: A gradual increase in volume. Decrescendo: A gradual decrease in volume. Diminuendo: Similiar to decrescendo, it is more about becoming soft then lessening the volume. Diphthong: Get acquainted with this term as soon as possible. It's vital! Dipthongs are vowel sounds with two distinct parts: the primary vowel and secondary vowel. It's as if the word has two syllables. For example, boy = bo-ee, my = mah-ee, eyes = ah-eez, etc. Dual member: A member who belongs to two or more Sweet Adeline choruses, generally but not limited to the same region. Yes, they exist! Tells you something about our organization, doesn't it? Dynamics: A combination of contrasting volumes, choreography, and facial characteristics used to deliver the emotional content of the story to the audience. Lead: The singer of the melody line, almost one hundred percent of the time. Overtone: An audible note that is higher than, and different from, the four pitches being sung by a chorus or quartet. It's a marvel of the human voice. Some may not understand what they are hearing, but it's there when you listen to an A-level chorus like Pride of Portland. 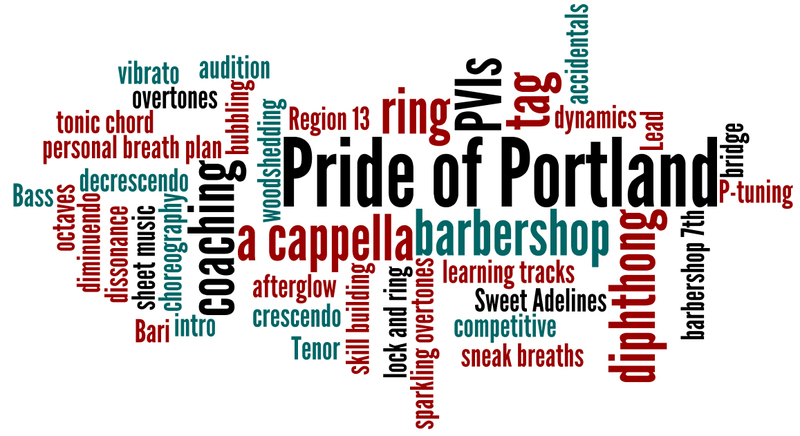 PVI: An acronym for Personal Vocal Instruction. Periodically, your section lead will conduct PVIs to build and reinforce vocal skills as well as review music and work through any rough spots a member may be experiencing with a particular song in the repertoire. Region: Pride is part of Region 13, the North By Northwest Region, which includes northern Oregon, Washington, Alaska, parts of Idaho, and Montana. Ring: The brilliant, bright "forward" sound in the voice that must be present to generate an overtone. Risers: The metal, stair-like structure that the chorus rehearses and performs upon. Sectionals: A mini-rehearsal for a specific voice part organized by the section lead outside of weekly rehearsals. Section Lead: Section leads (not be confused with the "lead" voice part) are members of the music team that oversee the education and training of each voice part. There are two to three experienced members leading each section. Sweet Adelines: A worldwide organization of women singers committed to advancing the musical art form of barbershop harmony through education and performance. Tag: The climax or ending of a barbershop arrangement. Tag is also used as a verb to describe learning a short phrase of a song with all other voice parts present. Tenor: The highest part in barbershop singing, not to be confused with a soprano of SATB music. See our barbershop page for more information.